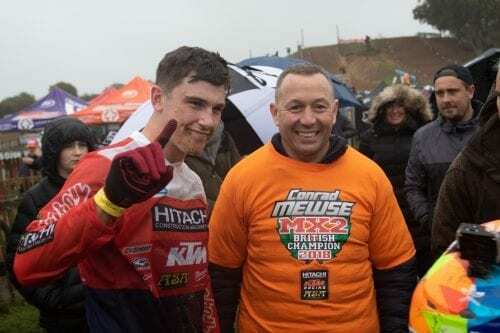 In what has proved to be a challenging season for the Hitachi ASA KTM UK motocross team, there was reason to celebrate at Lyng as the team’s MX2 rider, Conrad Mewse, wrapped up his respective Maxxis British Motocross championship at the final round. 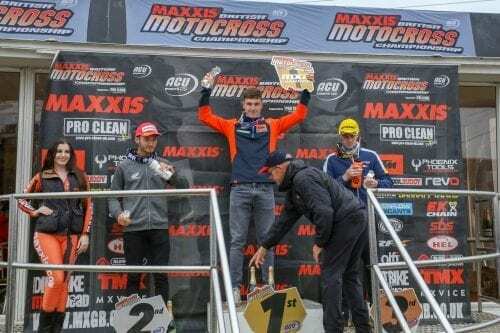 Winning nine races from 14, Mewse, has been the class act of the division on his KTM 250 SX-F and the title represents the twelfth British championship for the team with KTM since 2008. 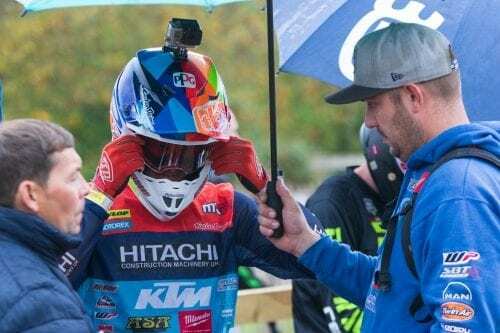 After losing valuable points due to breaking his hand in the previous British round at Hawkstone Park, Mewse came into the final round looking to exploit his 14-point lead over Honda ride, Joshua Gilbert, and secure his first British MX2 championship. With two other riders in contention for the title and 50 points still up for grabs, it was clear Mewse would be made to work hard until the very last race. The Shepton Mallet rider – who recently signed for two more years with the team – started the day with a bang, taking pole position in qualifying with a half a second lead over championship competitor, Mel Pocock. Team mate Michael Ellis also had a strong showing in the morning session, securing 8th place on his last flying lap. Conrad was one of the worst, going from pole setter to deep in the twenties. With a now mammoth task ahead of him, Mewse started his assault; working his way up to 14th as he crossed the line to start his second lap. From then on, each time the 19-year-old circulated he managed to secure another position until he overtook Lewis Tombs entering the penultimate lap, taking 4th position. This late in the race there was not enough time to bridge the gap to the leading trio of Walsh, Pocock and Gilbert, reducing his championship lead by two points. Conrad was not leaving anything to chance in Race 2, focused from the moment he stepped into the waiting area, he was READY TO RACE. 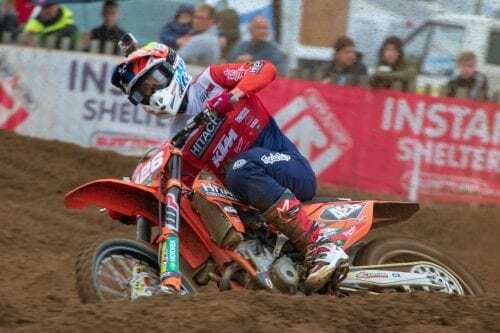 Launching cleanly off the wet, slippery concrete gates, Mewse shot off clear of the hungry pack, taking the holeshot into the chicane before gradually pulling a gap from second place Joshua Gilbert. 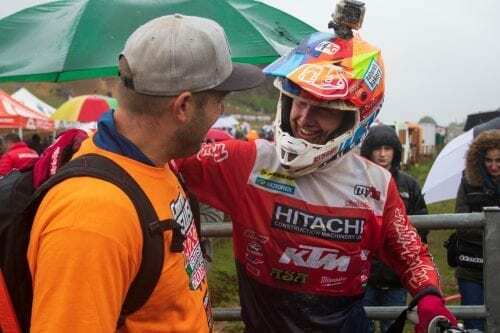 The ex-85cc World Champion set about a masterclass for the rest of the moto, pulling a 10 second lead over his title challenger and then perfectly managed the rest of the content to take the chequered flag as race, overall and British MX2 championship winner! After celebrating his achievement, Conrad Mewse said: “It was a tough day for me, I don’t know what to say really, but racing is racing. overall, it’s turned out the be a good day, I’m happy to take the victory, at times things could have gone very wrong but it’s all played very nicely, and I came out on top. I can’t thank everyone enough, all my family, my whole team, they’ve been fantastic this year, and with all the effort they have put in, the least they deserved was for me to bring home the title! It’s a shame Graeme crashed and couldn’t be here, he has been great all year, so it’s nice to retain a title for all of us as a team. Obviously, Graeme has had a tough year with a few freak injuries, like the burns, his damaged mouth and them Imola to finish it off – which is quite a severe injury. At one point he was in danger of losing his hand as the blood supply situation was extremely bad. He’s got the talent and work ethic, so we see him bouncing back and displaying his speed in 2019 after getting back to health.